So we did the HersheyPark thing on the way back from our bicycling vacation and our young lady rode seven of their eleven roller coasters. Not being all that strong of stomach, I wimped out after two and contented myself with taking pictures. I had decided to not lug a Big Camera and the tele-adapter along, seeing as how we’d be camping for four nights. That turned out to be a wise decision: it rained every night and everything we carried was damp. So I took pix with my Casio Z-850 pocket camera, which had been sealed in a ziplock bag most of the time, and that had to be good enough. 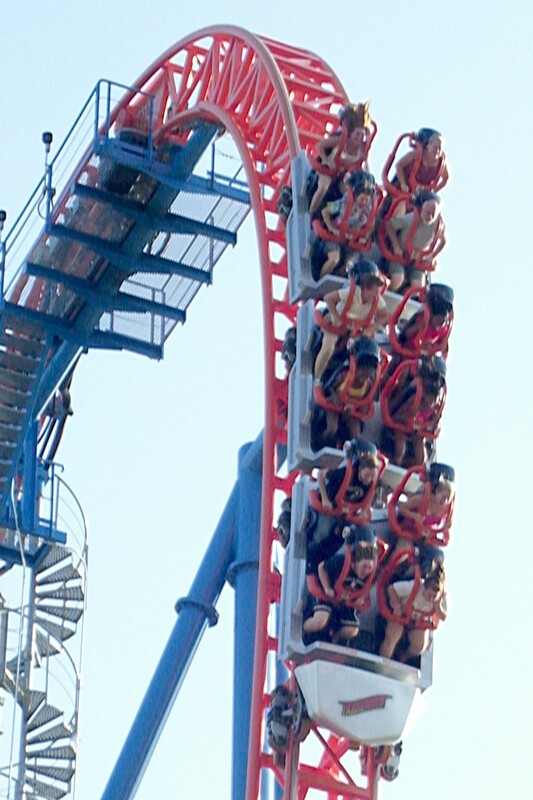 The Fahrenheit coaster is, they tell me, 121 feet tall and I was standing outside the fence about 100 feet from the base of the drop; the slant range was maybe 150 feet. I had plenty of time to set up and practice the shot, as the line was half an hour long. I filled the equivalent of two rolls of film with pix of people I don’t know while exploring a nine-dimensional parameter space & scrutinizing the results; pixels are cheap. Most digital cameras, this one included, have a long delay between pushing the button and getting results. However, it has several “continuous shutter” modes and I picked the “high-speed” version that records three images in quick succession. There’s no indication of how much time passes between exposures, which probably depends more on the SD Card’s speed than anything else. The timestamp resolution is 1 second, which isn’t much help. Anyhow, poking the shutter button when the train came over the top consistently produced one good picture as it descended. The camera picked ISO 200, probably as a result of the “high speed” continuous shutter setting, and warned me that it wasn’t happy about doing that. This being a bright, sunlit day, the nominal exposure for that ISO speed would be 1/200 @ f/16. Two stops faster shutter and three stops bigger aperture should work out OK, as the subjects were on the down-sun side of the coaster. The camera has just two apertures (big and little) that, of course, vary with the zoom setting, so I didn’t have much leeway. I figured I could fix any minor exposure issues in the cough darkroom. The tele end of the zoom range is equivalent to a 114 mm lens with 35 mm film, which is better than the beer-can-sized zoom on the SLR I used to lug around back in the day. Cropping the interesting part from the frame, goosing the gamma a smidge, and applying a touch of Unsharp Mask says that’s about right: you can see the expressions on their grainy little faces. National Geographic quality, it ain’t, but it’s OK for a pocket camera and pix of relatives. Memo to Self: Would forcing the ISO down to 100 reduce the graininess a bit?